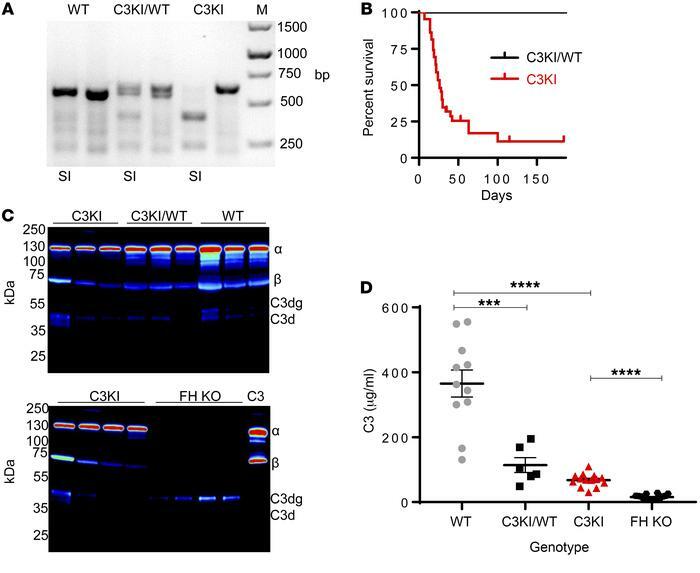 Initial characterization of C3KI mice. (A) A representative ethidium bromide–stained PCR gel illustrating genotyping of C3KI mice, with the SalI digest, as appropriate, indicated by SI below the gel. (B) Kaplan-Meier survival curve analysis of the first 44 C3KI and C3KI/WT littermates (F1–F3). Data for 44 WT littermates were identical to those for C3KI/WT. (C) Western blots of murine C3 derived from plasma (freshly collected into EDTA and run under reduced conditions) detected by goat anti–mouse C3 (MP Biomedicals). Mouse genotype is indicated above the lanes; each lane represents an individual mouse. Chemiluminescence image were captured using LI-COR Odyssey FC and displayed in pseudo-color. (D) Plasma murine C3 levels from 11 WT (gray circles), 6 knockin (KI)/WT (black squares), 15 KI (red triangles), and 16 FH-KO (black hexagons) mice were measured. Absorbance readings at 450 nm were converted to μg/ml using a standard curve based on purified mouse C3; mean ± SEM. ***P < 0.001 and ****P < 0.0001 using unpaired t test with Welch’s correction.